Discussion in '3rd Gen Tundras (2014+)' started by Silv333, Apr 12, 2019. You mind posting a few pics from different angles? Would love to see how it looks. I read on here once where a member got a slight hit in the rear hitting his hitch bump or his ball can't remember he was shocked the frame bent a little. So I stayed away from anything in my hitch let the bumper take the shock. I remember that, kinda makes sense concentrating the force into a pivot point. Wife went through two bouts of Physical Therapy from two separate 'Cell Phonie' accidents, getting hit while the other driver's face was buried in their phone. We bought the Super Bumper to help absorb some of the shock/damage, for the next time it happens. It's mounted on her Pilot. My Tundra's hitch stays attached+ I have a Best-Step "old guy step" to help with stuff in the truck bed. That is a great step, a few brands make them and so does Toyota (maybe it’s a rebrand). My friend has one on his RAM, kicks out easy to step up and hides away when not in use. I’ve been meaning to get one. Right now I don’t mind kneeling up on the tailgate’s bedrug. 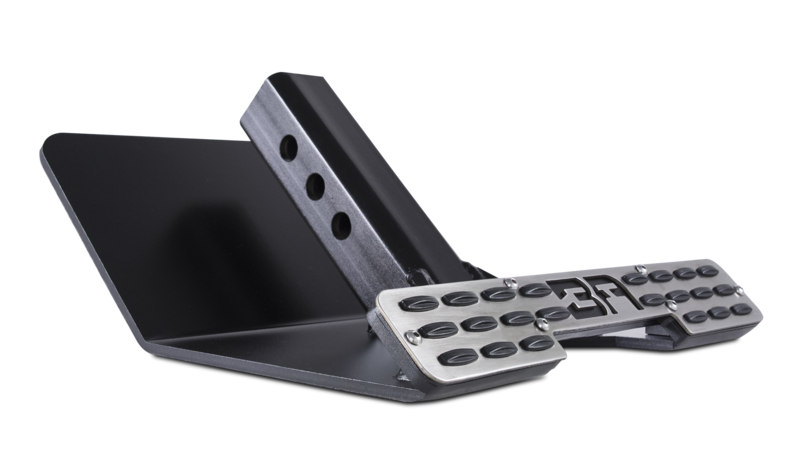 It has an integrated "skid plate" and bc is doesn't stick out as much, it won't affect departure angles too much. Why be interested for so long? It's just 100 bucks, order it! I like the rago fab bumper step. I haven’t seen anyone on here use it though. Amp Research makes the one Toyota sells. After shopping these different models, I bought the Bestop model because of it's larger size for less money. Everything but the Step-Pad is exactly like Amp Research's step. Pulled the trigger, thanks! The Bestop was on sale in Canada, almost $200 less than Amp’s. You're welcome, I've never minded spending money (just ask my Wife ) but sometimes with a little effort and searching, we can buy the best product for less. You got those pics sir? here's mine, I admit it's just for show, pretty light weight wouldn't stand up to more than parking lot bumps. EDIT-OMG nobody read at my plate. Going over to Facebook to tell everybody where I am going to be. This thing is a hog, I have little doubt it could stand up to the 10k rating the way this thing feels. I don't need a step, but the added protection if bumped from the rear is nice. I got it from Amazon, didn't look exactly same as yours but I took some of the below comments which made me favor the less smooth look for traction. The shape of yours was my inspiration. TGL I think is the company of mine. Same idea here, just not as bright as yours! JoshuaA and 4x4_Angel like this. Good idea, mind posting a few more pics just to see how far it hangs out? I don't have any closeups, it does stick out a bit. And I also have a Putco Blade that wards people back while driving, bright day or night. My big concern is parallel parking and having something back there if someone else doesn't know what they're doing. I'd rather them hit something like you have or the weathertech step versus my bumper! I might lean towards what you have. You have a locking pin? Where did you buy your setup from? D-ring shackles for 2" hitches are fairly common, I bought mine off Amazon Canada. I believe Rhino USA makes a good one. The locking pin is a generic one I had before, but I did have to grind the cylinder here to make the pin length wider. The lock mechanism inside is further down and shaving it did not affect integrity, the cylinder is a solid piece. Otherwise you have to find one that's long enough because the Tundra's receiver is a bit thicker than most. Read reviews, there's a Master Lock I almost bought that says it fits Tundra but then users complained the lock seized and the key wouldn't open it anymore even trying all sorts of tips, they had to hammer it off. Of course you could just use a regular pin if you're not worried about someone easily stealing the D-ring. Here’s what it looks like when it saves you from a direct hit. This would have damaged the whole tailgate without it. It absorbed most of the impact. You can see how the neck crumpled taking the blow.